This guide demonstrates how to use entity inheritance in CUBA applications. In the petclinic example different types of Pets are groomed during their stay in the clinic - cats, birds and rats. All these types of pets have some common attributes. The application should store common attributes within one table and use separate linked tables to store specific attributes for the different pet types. A user has a choice between different Pet types at creation time of a Pet. The system will show the corresponding editor accordingly so that the user will be also able to enter the type specific information. The data model contains the Pet entity, which is a base class stored in the table: PETCLINIC_PET. The entity inheritance is configured with the inheritance strategy JOINED. Therefore the data for the subclasses Cat, Bird and Rat is stored in three different tables. In the PETCLINIC_PET table all attributes that are inherited from the Pet Entity are stored. The attributes that are additionally defined in the subclasses (like Bird.wingSpread) are stored in the dedicated subclass tables: PETCLINIC_CAT, PETCLINIC_BIRD and PETCLINIC_RAT. The link between the two entries within the two tables (PETCLINIC_PET and PETCLINIC_BIRD e.g.) is done via a foreign key. Additionally, there is a special kind of column in the superclass called DTYPE. This column is only used internally by the object-relational mapper (JPA) in order to create the right instances in the java application when loading data from the database. For every class in this class hierarchy, a particular value is defined that identifies the (sub-)class of the hierarchy. In case of the Pet class hierarchy use the following values: CAT, BIRD, RAT as well as PET for instances of the superclass itself. The discriminator column value is defined through the @DiscriminatorValue("BIRD") annotation to the entity. This special column in the database is normally not exposed as an attribute to the entity layer. Instead, it is just used internally by the persistence layer to distinguish between the entity instances. In case the type attribute should be used by the user, it is worth considering creating another type attribute as an Enum within the superclass that contains all possible subclasses as entries. This allows to use the type information throughout the system in order to e.g. filter or sort through the UI. The Cat subclass as one example of a concrete Pet type looks contains two inheritance related annotations. 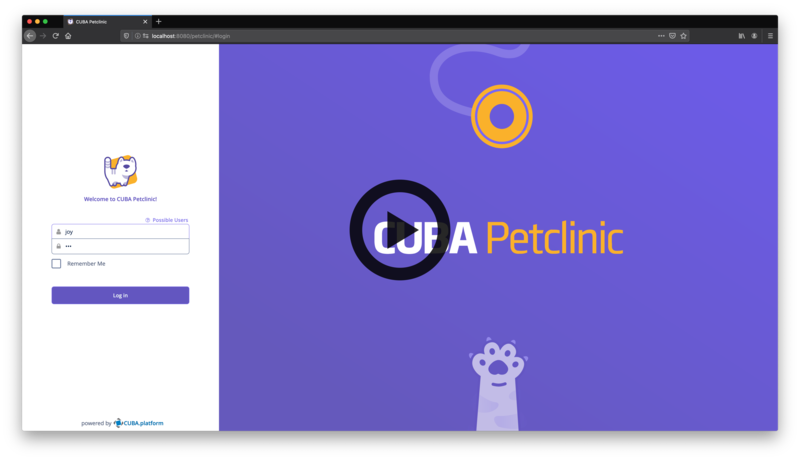 With this configuration in place, it is possible to create instances of cats through the JPA layer, where all Pet related attributes are stored into the PETCLINIC_PET table and the Cat related attributes are stored in the PETCLINIC_CAT table. Creating UIs based on entity inheritance needs some special treatment. In browse screens, there are options to either display all entries independent of the concrete subclass or only specific for a particular subclass. For editor screens, the concrete subclass has to be used in order to be able to enter the subclass specific information of the entity. In the example case of the Petclinic, there is a main menu entry point Petclinic > Pets. In this screen, all pets independent of their concrete type should be displayed. This behavior is possible when using the superclass Pet in the JPQL query. With that data container in place, all pets (Cats, Birds and Rats) are displayed in the browse screen. In this case, it is obviously not possible to display specific attributes of one or more subclasses in the table, since the superclass Pet is not aware of specific attributes like Cat.clawLength. In order to create different types of Pet instances it is required to differentiate at some point in the user interface between the concrete type, that should be created. Also, when it comes to selecting a concrete entity instance during a selection process, it is sometimes required to differentiate between the available types to select. The user interface for creating a new Pet will be adjusted within the browse screen of the Pet. When creating a new Pet, the concrete subclass has to be selected. With this dispatching code in place, the correct Editor screen for the concrete subclass will be opened. Within the Screen editor for the subclass (in this case CatEdit) the additional attributes of the Cat entity can be entered as well. In the Petclinic example, it should be possible to create a specific Visit that has some special settings for a visit of a cat. When a Visit for Cats is created the selection for the pet within the visit editor should be filtered to allow selecting only Cat entity instances. Furthermore, it should display the visit attributes that are only necessary for a cat visit. In order to achieve this kind of behavior, first a CatVisit entity is created which extends Visit. In this case, SINGLE_TABLE inheritance is used, which means that there is only one table containing all attributes of the superclass as well as all subclasses. When inheritance type SINGLE_TABLE is used, the additional attributes of a subclass cannot have a NOT NULL DB constraint, because for other entities within the entity hierarchy it is not possible to fulfill this requirement. The usage of @NotNull bean validation annotation within the entity layer is possible though. Another type of inheritance is the usage of the @MappedSuperclass annotation. Mapped superclasses allow sharing attributes and behavior on the entity level, but on the database layer they are explicitly not involved in the inheritance. In the Petclinic example, there is a class called NamedEntity. A named entity is a CUBA StandardEntity, plus it adds one specific field: name. This class is annotated with @MappedSuperclass indicating that it can be used for inheritance, but there is no explicit database table associated. A class that is extending NamedEntity like Specialty inherits all attributes from this class and stores them in its own table PETCLINIC_SPECIALTY. CUBA itself offers mapped superclasses for defining standard attributes across all tables within a CUBA application. StandardEntity is the most commonly known example. It e.g. contains the timestamp related attributes createTs and updateTs. In this data modelling guide, entity inheritance was introduced. Inheritance is a common way in object-oriented programming to share data and behavior through a class hierarchy. On the database level, the concept of inheritance is not directly available. But still, JPA as the OR-Mapper allows expressing inheritance with different patterns to bridge the gap between the two worlds. Entity inheritance is possible in different ways. MappedSuperclass allows only sharing attributes without using a shared table at all. When inheritance also should be represented, JPA @Inheritance annotation can be used. In this case it is possible that other entities can create associations that reference the entity inheritance structure (like Visit → Pet where Pet is an entity inheritance). On a UI layer the entity inheritance has to be reflected as well. 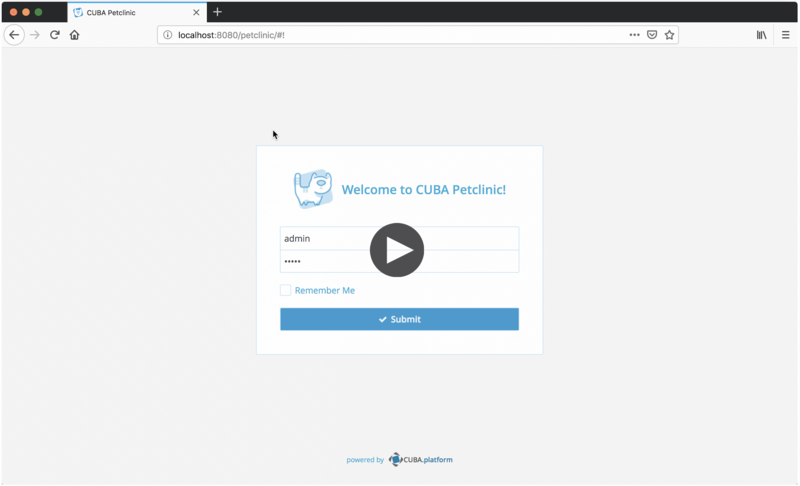 Depending on the use case, CUBA screens can be adjusted so that the user interface displays all entity instances of a hierarchy as well as only sub-parts of an entity inheritance.